A lantern burns brightly before Historic Kenmore. In today’s electrically-lit world, we have very little notion of exactly how dark it can be in a house without any artificial light at all. In fact, our modern eyes have become so accustomed to bright lighting at all hours of the day and night, that we would probably have an even harder time adjusting to the candlelight of the 18th century, were we to magically time travel back to that period, than those who actually lived then. Our ancestors were used to it, though, and had a variety of ways to make the most of the light they had after the sun went down. 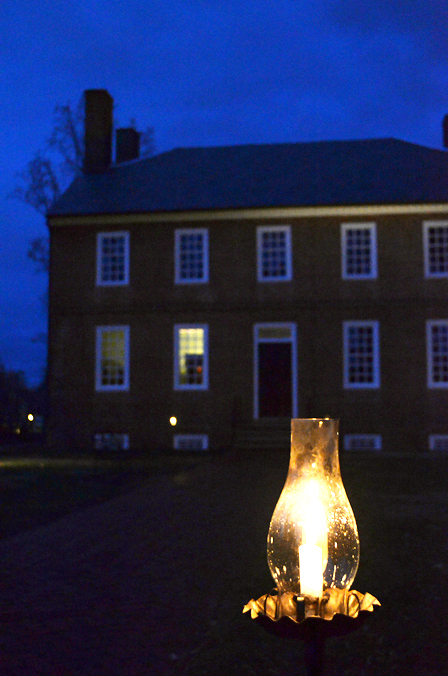 Sources of light after dark were the usual suspects – candles, fires in the fireplaces, maybe the occasional oil lamp. The best way to increase the light given off by each of these sources was reflection. Mirrors were placed behind candlesticks and lamps to double their light, and the lamps and candlesticks themselves were usually made out of reflective polished metal. 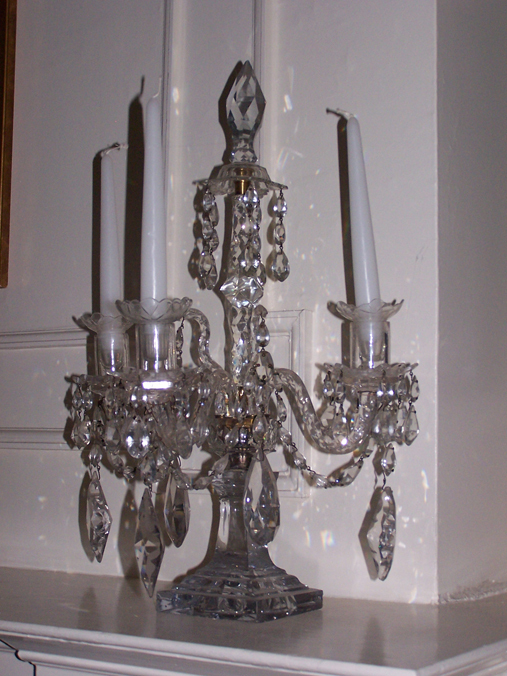 Candelabra or girandoles, which were fixtures intended to hold multiple candles at a time, were often made of glass and decorated with quantities of hanging crystals or glass pendants, all intended to increase reflection of candlelight. Candleabrum with glass pendants dating from the 19th century. Being able to transport your source of light was also important. Without flashlights or anything else battery-operated, people in the 18th century had to find ways to carry flame with them when they moved from room to room or left the house after dark. Chamber sticks were candlesticks with handles on them, most commonly used to light a person’s way to bed (hence the name). Enclosed lanterns, made either of metal punched through with holes, or glass panes, were also used both indoors and outdoors. Of course, if most of your light is coming from candles, keeping those candles lit could be a challenge. Glass shades, or what we often call “hurricanes” today, were not simply decorative in the 18th century. They were intended to protect candles from drafts (and had the added benefit of providing another reflective surface). The beeswax or tallow candles most commonly used in the 18th century tended to melt quickly, and so candlesticks that could automatically push the candle up as it burned were invented. These candlesticks ensured that every last useable bit of candle was put to good use. 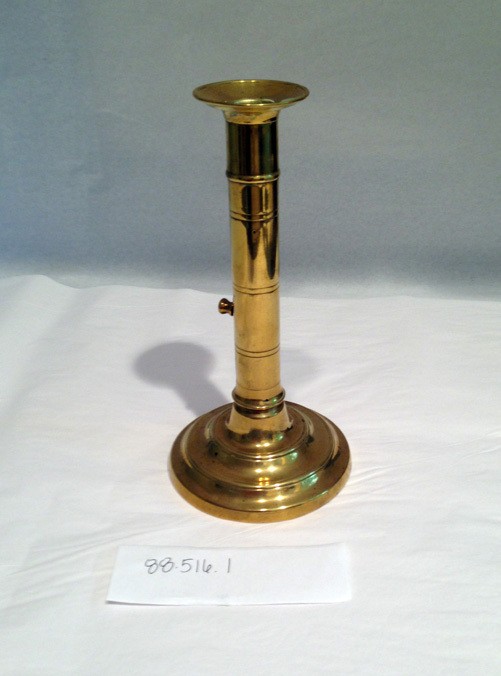 Brass push-up candlestick dating from the 18th century.